Bringing our digital 'A' game to the fitness space. In late 2015, Interesting decided to open its own fitness studio. We saw this as an exciting way forward, one that would allow to explore the ever-expanding fitness and digital space and reward our employees with free gym and PT access. We also saw an opportunity to get back to our digital basics. Efficient SEO, high impact Google Advertising, effective landing pages with high conversion, lower bounce rates - and all of the other marginal gains that are so essential to making your business a success online. Small low budget wins with big impact. We used our creative teams to produce a new brand that could sit side-by-side with the digital studio. We developed a motivation tone-of-voice that eschewed the traditional 'shout & shame' approach to gyms and worked hard to encourage results via enjoyable exercise - no more encapsulated than in the brand statement "Move Better. Smile Often". The visual design language includes the 'Pulse' - a symbol that brings to life the concept of 'constant forward momentum'. As a new, small business, speed to market and budget were essential meaning we created a simple website that could easily evolve and adapt as we introduced new learnings to push membership. 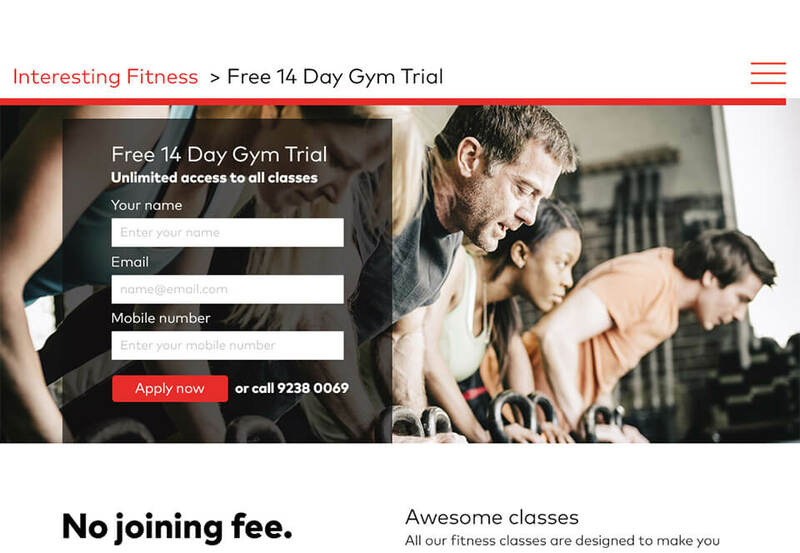 We used Google Adwords to test and refine key phrases, allowing us to position the gym correctly to our local market. SEO was used to ensure we performed well via search, and we created a series of landing pages that would allow us to target audience segments during the key period throughout the year. Interesting Fitness is a small business with a small team, budget and a small amount of time to make an impact. But that's ok! Small can be fast, accurate, easier to do and get done. It can be tested, quickly, adapt and punch above its weight. It's not an excuse to do less; it takes just as much effort. But done well many times, small can become big! The all-conquering Team, GB Olympic Cycle Team, will tell you that your competitors will soon see any gains you make and react. The low-hanging fruit disappears quickly; after that, it becomes a sport of hard work and marginal gains. Here at Interesting, we believe in the 'power of small'. Our expertise will help you identify what can be done to help you regain the competitive edge and stay ahead. SEO - The search term 'Interesting Fitness' ranks number one on Google with Interesting Fitness owning 80% of the first page. Against targeted search terms we regularly appear on the first page of Google, outperforming the big fitness players including Virgin Active and Fitness First who significantly outspend us. Analytics - Landing page conversion rates are 12%, beating the industry average of between 2.5% - 5%. Homepage bounce rates perform even better at 22%, beating the industry average of between 40% - 60%. Google AdWords - With low spend and rigorous testing we were able to have our ads position consistently between 1.1 and 1.4 on Google. Click through rates (CTR) on high-value terms such as 'gyms in CBD Sydney' (5.56% CTR) and 'gym Sydney CBD' (9.09% CTR) beating the industry average of 2%. The site is lightweight, responsive and quick to load. Built like we train - We are only just getting started.